Lạc Giới is the outstanding winner in Vietnam Film Festival 2015 with the Golden Kite Award for Best Feature Film (director: Phi Tiến Sơn), Promising Young Talent Nguyễn Bình An, and Best Actor Trung Dũng. It presents a tragedy about a group of socially discarded people in their real-life interactions. The serious topic is developed with delicate and yet exciting plots. On first impression, it can be viewed as a gangster movie about a prison break. Yet as the narrative builds with the viewers’ growing insights and surprises, it might be considered an ethic religious film, for there is an implicit clue of a biblical narrative playing out. Trung is a middle-aged robber on the run who hides in the trunk of a car. Kim, unknowingly transporting Trung, drives to a goat farm in a mountainous area where she works as a professional nurse taking care of Hai, a sick young man, as well as taking care of the farm. Hai is isolated from his family and stays in the farm with Kim. In the very beginning, the farm looks like a wasteland in the wild mountains. 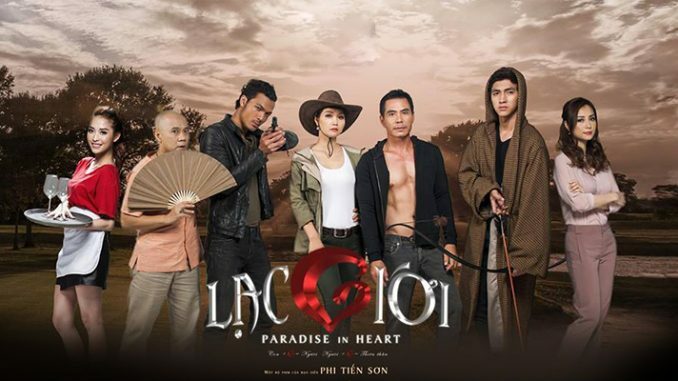 There is no hope and happiness: Trung fears of the police; Kim worries about Hai’s illness; and Hai hates his family for abandoning him. As Trung starts to work on the farm, Kim feels secure with his protection. Meanwhile, Hai is encouraged to take medicine as he admires Trung for his healthy body and courageous spirit. The temporary peace even stimulates Trung to compliment Kim’s beautiful appearance. Suddenly, Trung acts as a midwife to deliver a baby goat on a stormy night and this brings cheer to the farm. Accordingly, Kim spends a romantic night with Trung and she even believes that a beautiful life can continue from then on. Meanwhile, a police officer pursues a criminal in a fishing village nearby. He visits the most popular restaurateur in the village to ask for support. He also shows interest in Kim, the woman who drives frequently between the fishing village and the goat farm. He pursues the woman, while at the same time, he plans to chase down the criminal who he suspects is at he farm. As Trung helps care for Hai the men become closer. The peaceful triangular structure is broken by Kim’s jealousy. Kim drives Trung away but he comes back to take care of the sick young man. Kim calls the police officer to arrest Trung. Knowing what could happen, Hai wears Trung’s clothing and drives away on a motorbike to distract the police so Trung could flee successfully once more. In the story, religious themes, suffering, and the regard of others were used in the development of plots and to build psychological tension. Trung worries so much about Kim’s talk with the police officer that he risks beating her. But Kim feels delighted when she thinks he is jealous of the police officer. The three characters, Trung, Kim, and Hai all suffer from their intertwined relationship. In addition, they forget their original intention for being at the farm and are drawn into a whirlpool of emotions. It seems there is no real goodness apparent in the story. Hai hates his father who isolates him on the goat farm. Kim treats Trung with control and pressure, and Trung only helps on the farm in order to win permission to stay. Similarly, the policeman dates Kim not only out of interest in her but also in his efforts to track down Trung, the fugitive. As the plot develops, when they start believing in love, there is no simple distinction between simply right and wrong. Hai enjoys a milk bath in a tub with the care of Trung, and Trung enjoys cooking fish porridge for Hai. The two events remind them of their passed loving mothers. In the story, the meaning of suffering can be expressed as transformation similarly to biblical narratives. When one understands suffering as the path to love, s/he would embrace it unconditionally. An the end of the film, the three roles all show great transformation. Kim, once a bossy tomboy, is now in a maternity dress and is seen talking to her future baby. Hai recovered from mental and physical illnesses, and seen is living happily. Trung wins his freedom as he can go anywhere with his small boat on the sea. Lạc Giới can be appreciated from various perspectives. One of which is the spiritual transformation that comes along with suffering and love. Whenever you feel lost, the paradise is still in your heart.